Summary: Learn how to make repairs to an exterior wall, patch exterior render and repoint the mortar between the bricks or blocks. Render is an all-over coating made up of a mix of cement, lime and plasterer's sand. An area of damaged render can be easily repaired and should be applied in two coats. Use a cold chisel and club hammer to remove any loose render from the damaged area. 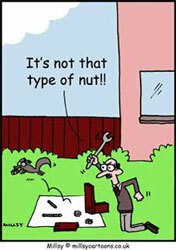 Then brush away any loose debris and dust from the area. Apply a PVA solution (one part PVA and five parts water) to the brickwork to help the new render stick. Although ready-mix render is available, it is quite easy to mix a small amount for repairs using one part cement, one part lime and six parts sand. Slowly add water so that the consistency is such that it remains sticking to the trowel when it's turned upside-down. Apply the first coat of render to the damaged area using a gauging trowel, pushing it firmly into the hole. The level of the render should be slightly lower than the wall surface. When the first coat has dried, score it with a nail or the edge of the trowel to create a key for the second coat. Apply the second coat, tying the edges in with the surrounding wall. Apply the first coat of render using a gauging trowel, pushing it firmly into the hole at a level slightly lower than the wall surface. 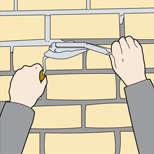 Pointing is the mortar between the bricks or blocks in a wall. If this mortar is damaged, you should consult a structural engineer to determine whether this is a sign of serious structural problems. If the problem is only caused by settlement, repointing work can be carried out. Remove the old, crumbling and loose mortar with a joint rake. Use a cold chisel and club hammer to remove any stubborn pieces of mortar. Then clear the dust and debris from the wall with a brush. Spray water over the area you are repointing to stop the bricks drying out the new mortar. Mix up some mortar in the following proportions: one part cement, one part lime and five parts sand. Add water until you achieve a consistency that allows the mortar to remain sticking to the trowel when it's turned upside-down. 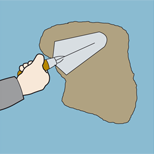 Heap the mortar on the back of a pointing trowel and apply to the joints between the bricks using a brick jointer. The jointer will allow you to replicate the appearance of the existing pointing. Remove any excess mortar in the joints using a dry brush. Heap the mortar on the back of a pointing trowel and apply to the joints between the bricks using a brick jointer. Join an existing conversation or create a new thread related to Gardens in our DIY forum.